Though the floor is beneath your feet, it always catches the eye. It’s the anchor to every room and the focal point of the home. So stop living with flooring that you don’t like. Discover flooring you can afford for every room of the home, and DIY your way to an eye-catching new design. Before you decide on the type of floors you want, figure out what it’s going to cost you. Measure (twice!) 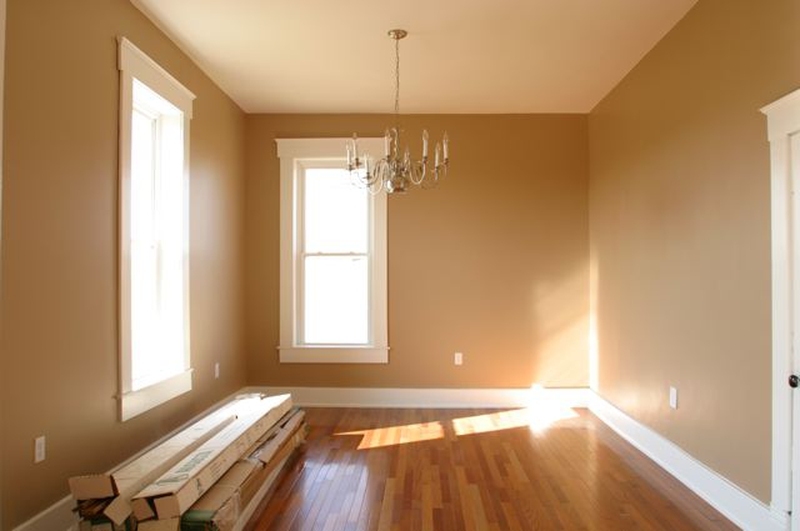 to get the square footage of every room you want to refurbish. Write down all your measurements and use an online flooring calculator to find out how much material you’ll need. Consider architecture when picking living room flooring, and remember to add square footage for halls and other areas. In many homes, the living room and hall area flow into each other. Often, this means you must extend your living room flooring and wall treatment down the hall as well. One of the easiest and most affordable DIY flooring options is laminate. It has the look and feel of real hardwood, but doesn’t cost nearly as much. Laminate is very easy for even the novice to install; it just snaps together. Make sure your measurements are precise, and installation should be time-consuming but simple. Laminate is a great living room and hall choice, but don’t put it in the bathroom. Over time, the humidity and water will affect the floor. On average, laminate flooring costs $1.00 to $4.00 per square foot. Living room and hall flooring can easily extend into bedrooms, and laminate is particularly nice and easy to care for in the bedroom. But if you want a little more softness and warmth to your bedrooms, you want carpet. Carpeting ranges in price, and installing it is a very tricky and lengthy process. Professional installation of brand-new carpet will cost you around $600 to $900 per 200 square feet, depending on the type of carpet you pick. Because carpet is available in a variety of colors and thicknesses, it’s a popular choice for many homes. Unless you know something about carpet installation, however, it’s not an easy or even feasible DIY. Avoid this issue and add an interesting design element with a large area rug. It gives you the warmth and a splash of color, and can be an interesting focal-point for the room. Pick bathroom flooring carefully. This room will be moist and hot, and that limits your floor options. Tile is hard-wearing and very affordable, though it requires skilled labor for the installation. Natural stone tile is very nice, but quite pricey. Porcelain tile can be purchased in a style that mimics natural stone, and it doesn’t cost nearly as much. Look for discounts and special deals, and you may find affordable marble or stone tile for as low as $2.00 per square foot. Porcelain tile can cost as little as $1.00 per square foot. Tile looks good in the kitchen and the bathroom. Installing tile is a time-consuming, precise process. It can be done by the casual DIYer with time and care, but it’s best if you have someone with tile experience to help. You’ll have to use grout between tiles, and you want to lay it out with perfectly straight lines. Tiling a bathroom floor is not a huge project, but the DIY can be complicated when you’re also tiling walls. Measure precisely and take great care to be consistent. Tile is a popular laundry room choice, but there is a simpler, more affordable option. Stained concrete is incredibly durable and beautiful. It’s very easy to care for, and that makes it perfect for the laundry room or the kitchen. Stained concrete is a great choice in the basement as well. Because the basement may serve many different functions, you need a versatile floor. Concrete staining costs $2 to $4 for each square foot. Before applying any new flooring, be sure to prep the subfloor well. It should be clean and free of debris to make installing the new flooring easier. Get the floors you want, at a price you can afford, and fall back in love with your home. Server responsed at: 04/25/2019 4:43 a.m.